What if Apple and other tech companies did diapers (like Amazon)? You might have heard the news that Amazon, one of the largest e-tailers on the planet, has launched its Amazon Elements brand of products where it will manufacture its own products, and even things like diapers. This, of course, turns out to be a perfect inspiration for the clever parodists from 'The Joy of Tech' who have wasted no time imagining what diapers made by the biggest tech companies could look like. 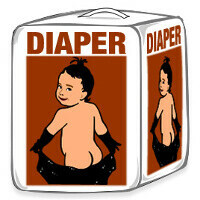 Imagine what would happen if Apple decided to put Jony Ive on the task of designing the perfect diaper. We sure hope it's not made of aluminium. Or what if Facebook came up with a socially connected diaper that would automatically share all the movements of your baby to the social network? You can find those, and a few other provocatively bad ideas in the cartoon right below. I was preparing to laugh. But ew. Didn't get the humor. Tell me about it. I'm high I and got nothing. Besides not being funny, it's not even a sharp social commentary or anything. This post is like a filler with no nutritional value. stuck in hospital.... so i am a bit jealous. Lol! Laughing at your comment. The Tommy Hilfiger article actually made me laugh. This article didn't. The Nest Contain was pretty funny, and as someone who has used WP, the Karma wasn't bad.